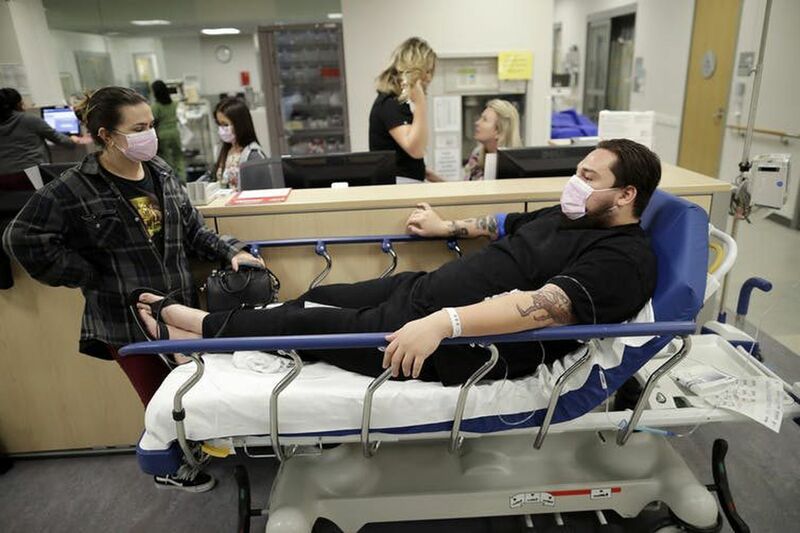 Donnie Cardenas, on bed, waits with his roommate Torrey Jewett at Palomar Medical Center in Escondido, Calif., Jan. 10, 2018. Cardenas had the flu. This has been a particularly bad influenza season, starting early especially in the South and West Coast in the U.S., but also affecting Pennsylvania and New Jersey. This follows a severe season in Australia during our summer. There are two subtypes of A influenza viruses involved. One of the subtypes, called A (H3N2), is known to be a bad actor. When that virus started circulating in the U.S., we public health experts began to worry that this was going to be a big year with a large number of illnesses and hospitalizations. I am a physician and epidemiologist at the University of Michigan School of Public Health who studies the flu and sits on advisory panels about immunization. Here are some answers to frequent questions I am hearing from people about this year's flu. 1. Should I still get vaccinated? Immunity from influenza vaccination takes about two weeks to develop. Doctors and public health officials still recommend getting vaccinated if you haven't done so already, because in much of the country, the outbreaks are still going strong, and flu transmission may last into April and May. Also, there is another type of influenza, B, and that often takes over late in the season. It is in the vaccine as well. 2. What symptoms should I be concerned about? Cough and fever are the most characteristic symptoms of cases, although the fever may not be prominent in older individuals. In the midst of an outbreak, studies I have conducted with other researchers have found that cough and fever are good indicators of who has the flu, although older people may not develop much fever. There are other symptoms characteristic of the flu, such as body aches and malaise, that may put you in bed for several days. You should contact or call your health care provider if you have these symptoms, particularly if you have underlying health conditions or are older. People with these risk conditions are more likely to develop complications which can be life-threatening. 3. Is it safe for me to go to the doctor? A lot of people wonder if they should go to the doctor's office. Most doctors have a way of keeping infected people away from non-infected people. However, with all the sick people who go for care in a flu season, a call first may help your provider advise on what you should do. 4. Should I ask for Tamiflu? One of the reasons to at least call your doctor is that he or she might be able to prescribe a medicine to help. There is a group of antivirals called the neuraminidase inhibitors that are effective in treating flu, especially if treatment starts early, within two days of onset. The main one is called oseltamivir (Tamiflu), and it has gone generic. Recent studies by our group at the University of Michigan confirm that the medication does shorten the duration of illnesses but, even more importantly, prevents complications. In adults, these complications are lower respiratory illnesses such as pneumonia and in children, otitis media or middle ear infections. Arnold Monto, Professor, Epidemiology, University of Michigan. This article was originally published on The Conversation. Read the original article.